QUEBEC CITY, QUEBEC — My first taste of Festival d’été de Québec was 1995. I was taking part in a summer course at Laval University and was invited to check out the event with a few friends. The person on stage was blues legend Buddy Guy, who made sure everyone in the audience was aware he had a Sweet Black Angel. That concert, to this day, is one of the most memorable live performances I’ve ever seen. If Festival d’été was a growing little secret in 1995, it’s anything but that in 2013. In 18 years since I first visited Quebec City, this festival has asserted itself as an entertainment powerhouse, without question one of the single most important music festivals on the continent. Since Guy in ’95, heavy hitters such as Madonna, Kanye West, Sting, KISS, The Black Eyed Peas, and Iron Maiden have rocked Quebec. Last year Bon Jovi, Aerosmith, Our Lady Peace, and Metric performed in 10 venues, on seven stages. This year, the lineup is just as fabulous, even though the weather didn’t cooperate as desired. The 2013 edition is headlined by Stevie Wonder, who plays on the closing night of July 14, and the Black Keys, Saturday’s main draw to the Plains of Abraham stage. To get things started for the 2013 festival, Catherine Major and Here We Go Magic greeted enthusiastic crowds in the rain on Thursday. On Friday night, the weather was much better, and the acts delivered, with Classified, Wiz Khalifa, Wu-Tang Clan, the Balconies, and Bad Religion taking their turns on stage. But it’s not just the big names that make this event a gem. When you break down the 2012 numbers, it becomes evident that this event is much more than just a series of concert. 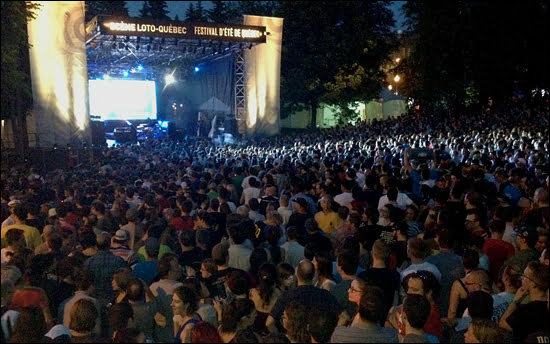 For Quebec City, Festival d’été is a tourism goldmine and a major economic driver for the community. Above all, it’s a source of pride for the citizens who have nurtured it and watched it grow over the years — and yet another great reason to visit this city, which skillfully blends the old and historic with the edgy and new. Last year, nearly 170,000 passes, front-stage zone cards, and single-day tickets were sold. The total budget for Festival d’été in 2012 was $22 million. The festival equates to $25.4 million in added value for Quebec’s GDP, with 470 jobs supported or created, and 7.4 million in tax and parafiscal revenues for the province and Canada, according to economic studies. According to InfoFestival.com, 18% of local festival-goers (32,760 people) scheduled their vacations around the event. Of 345,300 attendees, 2% were from the United States, 3% from other Canadian provinces, and 6% from other countries. Jonathan Ollat, manager at L’Atelier on hopping Grand Allèe East (Street), echoed those sentiments, explaining that the Summer Festival really brings the crowds to his restaurant — especially when the sun is shining and weather is hot. “In the 10 days during the festival, we can do about two months’ worth of business. 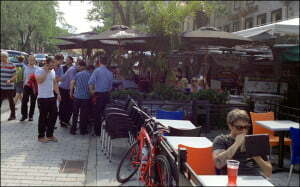 More or less, it’s like that,” said Ollat, who brought out about 30 additional seats to the L’Atelier patio, anticipating a busy night following Day 2 of the festival. In a city best known for its raucous Winter Carnival, it’s the summer festival that is often the talk of the music industry. With the amount of talent it attracts each summer, it’s no wonder entertainers and fans make it a point to be here each July, serenading the Plains of Abraham. Tickets: Full festival passes cost $76 and there is a limit of 75,000 full-event wristbands. Day and weekend passes are also available. To purchase, telephone 1-855-800-3347 (toll free), or visit the Passes page on the website. Upcoming Headline Performances: The Black Keys (July 6, 9:30 pm); Bruno Mars (July 8, 9:20 pm); MGMT (July 9, 8 pm); Rush (July 10, 8:30 pm); Guns n’ Roses (July 12, 9 pm); and Stevie Wonder (July 14, 9:15 pm). Vacay.ca Also Recommends Canadian Talents: Diamond Rings (July 8, 8 pm); Bahamas (July 11, 9 pm); A Tribe Called Red (July 9, 9:30 pm); Monster Truck (July 12, 7 pm); and The Sheepdogs (July 14, 10:15 pm).